Make any photo into a funny one. Put yourself next to a celebrity or move to any point on the globe ? by means of photomontage. 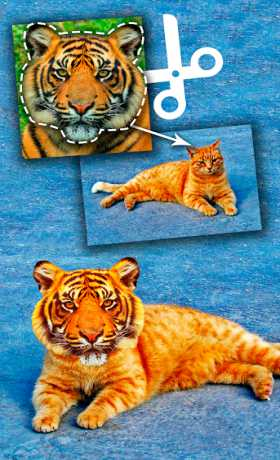 Swap your face between friends or swap faces with superstars and cute animals ?. Simple to use. Import photos from the photo gallery or find them on the web ? using image search. 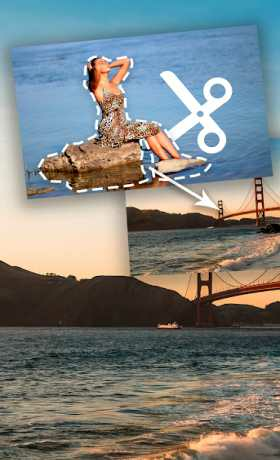 Cut ✂ what you need, indicate where to paste the pic, and the app will do the rest. Tip: In order to make the cuts less visible on the final picture, try to use a background with ‘transparent’ texture (water ?, rainbow ?, clouds ☁, sand ? etc.). Share your funniest image with friends via favorite messengers and social networks ?.